The Takamine G124S Acoustic Guitar is a Classical Gloss acoustic with nato back and sides, Solid spruce top, Marquettery rosette and bound fingerboard. The G Series has created great controversy. Play a G Series guitar and you’re apt to think it’s one of the finest acoustic/ electrics made. Guitars that will grow with you. The G Series from Takamine has created great controversy. The Takamine G330S Acoustic Guitar features Solid Spruce top, Nato back and sides, Rosewood fingerboard, Chrome tuning machines. 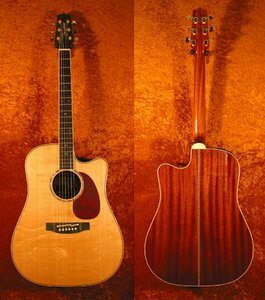 With Satin finish acoustic Dreadnought this guitar rival the mid and many upper line models of other popular makers. an incredibly affordable guitar with truly high-end tone. The Takamine GS330S Acoustic Guitar gives you genuine Takamine tone. There’s no imitating the silky-sweet sound of a genuine solid cedar top, so they’ve built a beautiful instrument around this one with laminated nato back and sides and a light satin finish. The result is an incredibly affordable guitar with truly high-end tone. Rosewood fretboard and expansive dreadnought body style. The Takamine Jasmine series S35 is a great beginner to intermediate guitar. The Takamine Jasmine S35 Acoustic Guitar features a spruce top and mahogany back & sides with a satin finish. Contemporary styling and time-tested construction methods produce an instrument that is built to last and, most importantly, sounds powerful and clean on all strings, from treble to bass. Chrome covered tuning machines and a rosewood fretboard are also featured. The best deal you’ll find in a great acoustic guitar. each soundboard is individually voiced to maximize its power and dynamic range. The Takamine ENV340SC Nashville series Guitar is a 6 string acoustic guitar. This acoustic Guitar has a dreadnought cutaway body shape, solid bear claw spruce top, abalone rosette, abalone headstock logo, abalone snowflake inlays, solid mahogany back and sides, ebony fingerboard, tinted wood backstrip, and gold tuners. Hand-crafted of all-solid woods by a special team at Takamine, Nashville models are as close to a luthier-built instrument as you will find from an international guitarmaker. The tops are solid, hand-selected “bear claw” spruce which creates a rare, naturally occurring pattern. Each soundboard is individually voiced to maximize its power and dynamic range. The back and sides are solid, the ebony fingerboard is fitted with nickel silver frets, leveled and finished by hand for perfect playability and intonation. The soundhole and perimeter of the top are inlaid with hundreds of pieces of beautiful abalone shell. Equipped with a Takamine pickup and CT4B preamp.